Fluorides of calcium of CaF2 with the most various color: colourless, white, yellow, gold, orange, red, brown, green, greenish-blue, violet-blue, grey, purple, bluish-black, pink, rose and raspberry. Colouring is related to the admixtures of chlorine, ferrous iron, uranium, by the defects of crystalline structure which very thinly reacts on heating. 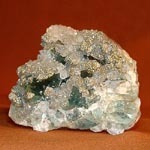 A mineral is fragile and soft. It is zonally painted, often shows a surprising zonal structure, conditioned numerous alternation of layers of different thickness and different colouring. 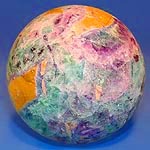 Perhaps, in the world there is not a mineral which would possess so wide gamut of colouring, what possesses Fluorite. But on a sun light or from time some tints of Fluorite can change. Stone is used from antiquity for making of not large types of tableware, vases, small boxes, and also in decorations. It was before valued higher than gold on the unique qualities and beauty. 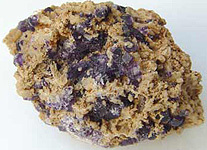 Presently Fluorite is used in an optics, in melting smelting furnace industry and jeweller decorations. It industrial mineral. It is impossible not to mention another surprising property of Fluorite - luminescence, luminescence under an ultraviolet source (phptoluminescence) or at heating (thermoluminescense). Be found as well well-educated cube, rarer octahedral and rhombic-dodecahedron shape crystals measuring 3-5 sm, sometimes to 20 sm and even more. From a Fluorite vessel, containing sulphuric acid of H2SO4, gas bubbles are selected, at dissolution of this gas of HF acid, adopted on the name of mineral of hydrofluoric fluorspar, turns out in water. Fluorite - most violet from all of the unennobled minerals. 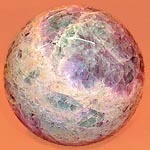 There is Fluorite and intense-lilac, almost black. There is Fluorite and gently-lilac, givings in a bright blue color. In nature there are blocks of Fluorite, simple or cut away on tops octahedrons - cuboctahedron. But most characteristic and typical Fluorite forms continuous semilucent blocks in ore vein, lode, mines. 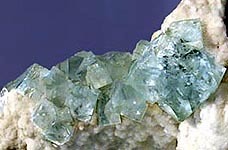 In-bulk Fluorite prisms, columns or thin fibres, going away a fan from the fragments of rock, are dimly guessed, by a bulldoggen gangue. 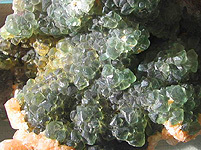 The columnar aggregates of Fluorite are formed by toothed, whimsical frost-works. Downlow pole Fluorite - most typical and showiest. These giant joints of crystals is semilucent and varicoloured. Rhythmic changing of colouring, get-away depthfirst semilucent volume of stone striation, twinkling of light on the planes of cleavage is converted by Fluorite in magnificent decorative material. The palette of Fluorite is generous: besides a purple, violet paint, in it show up and rose, and yellow, and green colors. Fluorite since olden times was a main substitute (by an imitator) almost any jewel. But since the synthesis of hard and ablaze artificial crystals became the matter of course, in jeweller practice of Fluorite not used practically. 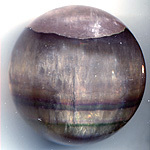 Fluorite is transparent to the infra-red (invisible thermal) rays. An infra-red optics allows to take pictures from satellites, sm and lead airplanes and ships in complete fog, to study the atmosphere of distant planets and underlying structure of alloys and minerals. If to melt light (even and not ideally colourless) and partly transparent Fluorite, from fusion it is possible to get clean raw material optically. Colourings of Fluorite unlike many semiprecious stone are determined not only admixtures. Where does the intense-lilac undertake from, by spots spread blur on a crystal colouring? These ink-black Fluorite does not almost contain admixtures usually. Sometimes there is a some more, than it is fixed on a formula fluorine in them. Scientists paid attention on this surplus fluorine. And yet on the smell of ozone: it is needed to break up the ink-violet piece of Fluorite, as a perceptible admixture of ozone will appear in mid air. 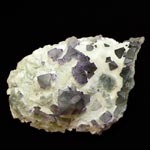 In colourless, unalloyed Fluorite it is possible to cause the ink colouring, skipping the digits of electric current through a crystal. Under the action of external reasons (digit of current or radiation) the lattice of crystal can be distorted, defects appear in it. A lot of defects is special can appear in a crystalline lattice, if there is an insignificant admixture of radio-active uranium or thorium in a mineral. A lattice at a mineral is ion, I.e. how many negative charges, so much and positive. If there is surplus or lack of electrons in some knot of lattice, part of ions moves from the knots of lattice in intervals between them, and emptiness - vacant place, "hole" appears in a knot (defect). Physicists name its "electron-hole center of colouring". Crystals try to remove a defect in the lattice. Eating up part of light energy, the ions of lattice come in excitation: their electrons jump off from the orbits (electronic levels) and taken holes, as traps. Rays, near thermal (red and orange), are taken in here, and minerals are painted in cold blue, dark blue, purple and violet tones. These paints and characteristic for Fluorites. Electrons, gettings in the holes of lattice, are fastened unfirmly and easily return on stationary electronic levels. Thus they return bulldoggen energy, emitting more "cold" light rays - mineral shines, fluoresce. The similar phenomenon is observed in Amethyst - to the violet and lilac variety of quartz. Helps to put in an order ideas and obtain heartfelt rest. Increases the analytical capabilities of people. It is a talisman of thin people, able to value and understand thin influences, aspiring to mysterious, because Fluorite not only opens astral capabilities, but opens the thin world which far not every can be oriented century Other people can use stone only as a doctor. True, at ability to apply with energy in general, Fluorite unusually strongly supports and regulate activity of mental energy, instrumental in people, to carrying on scientific activity, and also pioneers and discoverers. Fluorite is able to absorb all of types of energy and generously presents by it an owner, up to that can give a people possibility to hear "music of spheres" or will begin to respond to singing of proprietor, and will sing some. 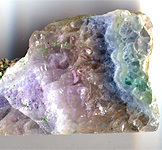 Fluorite speaks with a people and light: the heat of hand or body of owner is enough to him, to begin to speak with him, but, again, it is clean the personal work with a stone. Prefers not to notice the rough people of Fluorite quite and never will consider such an owner, but will begin stubbornly to be quiet and will submit no actions. Stone helps spiritual growth of people and, as many consider, is not the native of planet, but - by a space new-comer, sent to help an evolution on Earth, to the comprehension what be going on and to the change consciousness of people humanity.